Ray Grant Sierk was born on 15 January 1887 in Attica, Wyoming County, New York. He was working on the home farm, according to the 1910 census. 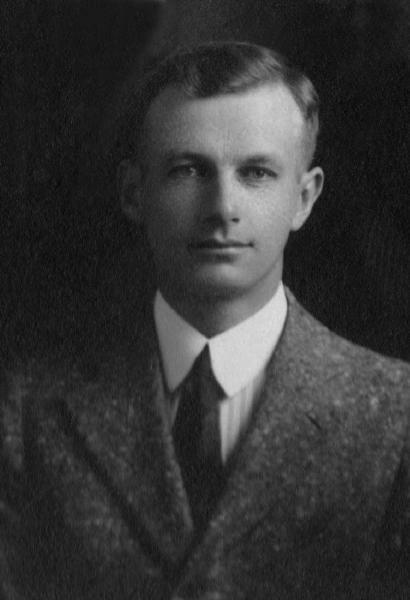 He married Carolyn Broadbooks, daughter of Martin P. Broadbooks and Caroline Bauer, circa 1915. Carolyn's first cousin Alta Broadbrooks married widower Percy Luther Cady, father of their daughter Evelyn's husband Percy Jr..
Ray Grant Sierk registered for the draft on 5 June 1917 in Westchester County, New York, living with his wife in Crater Lake, and self-employed there as a farmer. Cleveland Broadbooks appeared in the US federal census of 1 January 1920 in Attica, New York. Other members of the household included Ray Grant Sierk, Caroline Bauer, Carolyn Broadbooks, Norman Lindsey Sierk, Evelyn Cora Sierk and Edith Sierk. He was a farmer, according to the 1920 census. Ray Grant Sierk and Carolyn Broadbooks appeared in the US federal census of 1 April 1930 in Attica, Wyoming County, New York, at Creek Road living next to Ray's brother Glenn.. Other members of the household included Norman Lindsey Sierk, Evelyn Cora Sierk, Edith Sierk and Paul R. Sierk. He was a farmer, according to the 1930 census. The following appeared on 20 July 1939 in the Wyoming County Times: Ray Sierk of Darien and Glenn H. Sierk of Attica have been granted letters testamentary on the estate of their father, Henry Sierk of Attica who died May 19, 1939 and left real estate valued at $3,000 and personal property valued at $800. The heirs are the five children, Glenn of Attica, Ray of Darien, Leo Sierk, Lillian F. Ames of Attica and Mary E. Guenther of Niagara Falls. By the terms of the will the piano is left to the daughter, Lillian Ames and the rest of the property is to be divided equally between the five children. The following appeared on 29 February 1940 in the Wyoming County Times: Notice of Farm Sale. We, the undersigned, executors of the Last Will and Testament of Henry Sierk, late of Attica, N. Y., deceased, offer for sale at public auction to the highest bidder, the farm owned by decedent in his lifetime, and formerly owned by Carmi V. Lindsey, containing 207 acres of land, situated about three miles southerly of the Village of Attica upon the Creek road, at the office of W. E. Hopkins, Attica, N. Y., on the 9th day of March, 1940, at eleven o'clock in the forenoon. this farm is desirably located and is an especially good dairy, grain and bean farm, and has a good supply of running water. Ray G. Sierk, Glen H Sierk, Executors. The following appeared on 16 June 1962 in the Niagara Falls Gazette: Mrs. Mary E. Guenther, of 1887 Cleveland Ave., a resident for the last 46 years, died unexpectedly in her home Friday (June 15, 1962). She was 72. Mrs. Guenther was a native of Attica. She was an active member of the First Presbyterian Church and belonged to the Women's Association at the church. She was also a member of the Mother's Corner Club. Mrs. Guenther was the widow of Gaylor S. Guenther, a local contractor, who died in 1952. Surviving are a son, Jack G. Guenther, this city; two daughters, Mrs. Robert (Marilyn) Wilson, of Fairport, and Mrs. Donald J. (Jean) Stone, of North Tonawanda; a sister, Mrs. Harold F. Ames, and two brothers, Glen and Ray Sierk, all of Attica, and another brother, Dr. Leo Sierk, of St. Petersburg, Fla; and seven grandchildren. Services will be held at 11 a.m. Monday at the Gridley Funeral Home. Burial will be in Forest Hills Cemetery, in Attica. Ray Grant Sierk died on 15 July 1968 at age 81 in Darien, Genesee County, New York. Carolyn Broadbooks became a widow at his death. He was interred at Forest Hill Cemetery, Attica, Wyoming County, New York. The following appeared in the Wyoming County Times: Ray Grant Sierk, 81, of Harper Rd., Darien, was discovered dead in a field behind his home early July 15, 1968. Death was attributed to a heart attack. He had been in failing health for some time. State Troopers theorized he was fatally stricken while walking in the field. Mr. Sierk was born in Attica, Jan. 15, 1887, a son of Mr. and Mrs. Henry Sierk. A member of the Darien Methodist Church, he was a retired farm operator. Surviving with his wife, Carolyn Broadbrooks Sierk, are two sons, Norman and Paul Sierk of Darien; two daughters, Mrs. Percy (Evelyn) Cady of Darien and Mrs. Sherman (Edith) Bolles of Houghton; six grandchildren; a sister, Mrs. Lillian Ames of Attica; two brothers, Dr. Leo Sierk of St. Petersburg, Fla., and Glenn Sierk of Attica. He was a brother of the late Mary Guenther. Services were July 17, 1968 at the Marley Funeral Home with the Rev. W. Donald Houser officiating. Burial was in Forest Hill Cemetery. The following appeared in the Wyoming County Times: (Attica) Glen H. Sierk, 80, an Attica native and lifetime resident died at 10:20 p.m. Saturday (July 19, 1969) in the Castile Nursing Home where he had been a patient for nine months. Mr. Sierk, who operated a farm on the Creek Rd. for a number of years, was born April 6, 1889, a son of Cora and Lindsey Sierk [sic]. He was a member of Attica Lodge 462, F & AM. Mr. Sierk's wife was the late Thelma Seligman Sierk. Surviving are a brother, Dr. Leo C. Sierk of St. Petersburg, Fla; a sister, Mrs. Lillian Ames of Attica; nieces and nephews. He was a brother of the late Ray Sierk and Mrs. Mary Guenther. The Rev. Donald Housser of Attica-Darien United Methodist Church officiated at services at 1:30 p.m. July 22 at the Marley Funeral Home. Burial was in Forest Hill Cemetery.